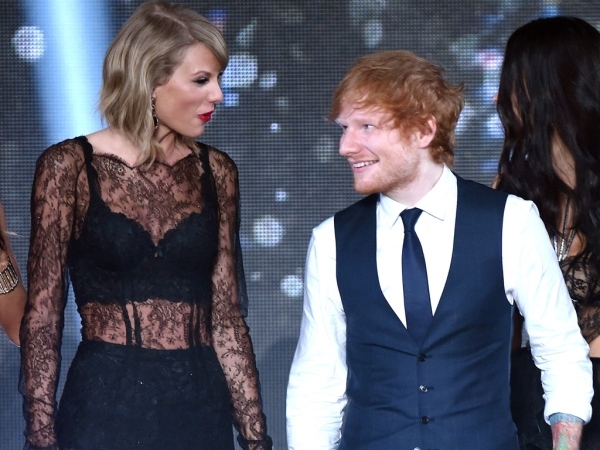 Ed Sheeran has been told to cut Taylor Swift from his social circle by his girlfriend, according to reports. The Sing performer has been dating Athina Andrelos since early last year. But it seems the beauty has become increasingly concerned by his close friendship with the Shake It Off singer, who most recently thanked Ed during her Brit Awards acceptance speech. “It’s incredibly awkward for Ed, because Athina doesn’t want Taylor anywhere near them or their social circle,” a source told the US edition of OK! Magazine. The 24-year-old has been friends with Taylor for a number of years and supported her on a leg of her 2013 Red Tour. But it seems the redheaded singer doesn’t want to upset his new love, but at the same time can’t imagine not spending time with the American. “[He] is respecting her wishes [but] he digs Taylor, too” the insider continued. Ed regularly spends time with the 25-year-old and they even recorded a duet, Everything Has Changed. But it seems the straw that broke the camel’s back for Athina could have been Taylor’s gushing speech when she won International Female Solo Artist at the London awards ceremony on February 25. However the blonde beauty may not be the only problem in Ed’s relationship, as British newspaper The Mirror recently claimed that the couple were on the rocks because of his busy schedule. “Things haven’t been as good and Ed has just headed off on a world tour which will keep them apart for months,” an insider told the outlet.